I was going through my Google Reader folder on journalism when I saw an announcement from the City University of New York’s Graduate School of Journalism that it was creating J-Camp to offer the latest in multimedia training. Classes already on the J-Camp schedule include 10 Tips for Taking Better Photos Sept. 28, Making the Most of Your Digital SLR Camera Oct. 5 and Secrets of the NYC Economy: A Crash Course on City Economics, Business and Politics Oct. 7. “We’re also going to have a video workshop for print journalists that will teach participants how to shoot and edit video,” said Caplan. “After an intensive two-day workshop, you’ll be able to create a high-quality two-minute video.” Other courses will include photography and creating charts and graphs, he added. Creative Live is partnering with O’Reilly Media to offer a free 5-week online course “Getting the Most Out of Google Apps for Business” on Tuesdays from Aug. 31 to Sept. 28. Creative Live is holding a free 4-week online course “Web Design Boot Camp with Erik Fadiman” on Wednesdays Sept. 1 to Sept. 22. Sept. 1 is the deadline to apply for 25 for 25 – The AOL Grant Program. AOL is celebrating its 25th anniversary by awarding 25, $25,000 grants to tomorrow’s ground breakers and visionaries in journalism, art and innovation who believe in the power of ideas. Media Bistro will hold the online course Boot Camp for Journalists for eight Thursdays Sept. 9 through Nov. 4. The course will help you create a new portfolio of work and a new set of skills. Assignments include a service/how-to piece, an arts and culture review, a profile, a metro section piece, an editorial, a business/news article, a personal essay, and two pitch letters. The cost is $499. The Donald J. Reynolds Journalism Institute is offering a free workshop — Engage Your Community to Power Your Business Coverage – in San Francisco Sept. 1. Media Bistro will hold the online course “Reinventing Print Content for the Web” on Mondays Sept. 13-Oct. 25 from 9-10 pm Eastern time. In this 6-week course students will learn the essentials of creating successful magazine sites and what that means for print magazine writers and editors. The cost is $425. The Donald J. Reynolds Journalism Institute is offering a Webinar – Develop Business Angles on Any Beat – Sept 14. Chad Graham, social media editor at The Arizona Republic, and Robin J. Phillips, Reynolds Center Web managing editor, will co-present this one-hour Webinar that will be of interest to all journalists and editors who understand the importance of exploring the business angle of every story. The Washington, D.C., chapter of the Online News Association is holding a meet-up Sept. 14 at Medill, 1325 G Street, NW, Suite 730 at 7:00 p.m. Josh Hatch and Amy Eisman, ONA10 co-chairs, will give you a VIP sneak peek of ONA’s upcoming 2-day conference Oct. 28-30 and let you know what workshops and events you won’t want to miss. DJTF member Tiffany Black is teaching the Media Bistro course “Intro to Social Media” for 4 Wednesdays, Sept. 22-Oct. 20 from 9-10 pm Eastern time. The cost is $350. The Donald J. Reynolds Journalism Institute will host Block by Block: Community News Summit 2010 Sept. 23-24 in Chicago. Reynolds Fellow Michele McLellan and New York University Journalism Professor Jay Rosen will lead discussions from leading pioneers of online local news sites to discuss what’s working – and what needs work. The event is invitation-only. The Poynter Institute is holding the Video Storytelling Workshop: 2010 Edition Sept. 25. The event, held with the National Photographers Press Foundation team, will present a day-long event that will help you be a better video journalist. Tuition is $65. City University of New York’s J-Camp will be holding the course Secrets of the NYC Economy: A Crash Course on City Economics, Business and Politics October 7th, 6:30 – 8:00 p.m. at the CUNY Graduate School of Journalism. The cost is $29 for early registration and $35 at the door. Columbia University Journalism Professor Sree Sreenivasan will hold a four wee-course entitled “Smarter Social Media for Journalists, Bloggers and Media Professionals.” Scheduled for Thursdays, October 7, 14, 21, 28, 2010; 6:30 – 9 p.m., the course will teach participants how to use social media, including sites such as Twitter, Facebook, LinkedIn, FourSquare, YouTube, among others, to find new story ideas, trends and sources; connect with readers and viewers in new ways; bring attention and traffic to their work; and create, craft and enhance their personal brand. The cost is $495. The BlogWorld New Media Expo will be held at the Mandalay Bay Hotel in Las Vegas Oct. 15-16. Think like Google — what you need to know about SEO is a Webinar being offered by the Donald J. Reynolds Journalism Institute on Oct. 19. The hour-long session will help reporters and editors understand the Web and how search engines find online content, explain some fundamentals of SEO and why journalists should care and give journalists tips and tools for writing good headline and ledes for the Web. Media Bistro will hold the online course “Intro to Multimedia Journalism” on Thursdays Oct. 21-Nov. 18 from 9-10 pm Eastern time. In this class you’ll learn how to translate news stories into fascinating multimedia packages. Columbia University Graduate School of Journalism is holding a “Two-Day Final Cut Pro Workshop” Oct. 23-24. Students will learn to capture footage, import images, text and audio files, edit from larger clips and trim footage in a timeline. Participants will also learn how to mix audio levels, create text, animate images and export video for broadcast or the Web. The cost is $695. The Interactive Innovative blog posts about a series of multimedia training with Maine Media Training from now through Oct. 30. Courses include Stills & Video for Multimedia; One-man Band; Intro to Web Design; and Audio Narrative. For more information go to Maine Media Training. Registration is now open for the Online News Association’s annual conference in Washington, D.C., Oct. 28-30. The Poynter Institute’s News University will hold the webinar Becoming a More Effective Editor: Strategies for Editing Yourself, Others Nov. 1-19. The cost is $399, and the application deadline is Oct. 4. The Freedom Forum Diversity Institute is offering a Multimedia Boot Camps for Journalism Professionals and Educators. The boot camp is scheduled for Nov. 17-21 at the Freedom Forum’s John Seigenthaler Center in Nashville, Tenn. The cost is $850. The 2011 Kiplinger Fellowship will award 15 grants to journalists to help them hone their social media skills and learn about SEO, strategic tweeting, and other information about the Internet. The deadline to apply is Nov. 30. The Donald J. Reynolds Journalism Institute is offering the Webinar Writing Business News for the Web Dec. 1-2. This Webinar will help writers and editors write with clarity, efficiency, brevity and transparency. Columbia University Graduate School of Journalism is holding a Five-Day Intensive Digital Media Boot Camp Jan. 10-14, 2011. Participants will learn the basics of visual storytelling concepts through video production and post-production with Final Cut Pro (for Mac). Participants will leave with concrete skills and a better understanding of the technologies that are transforming the news business. The cost is $1,195, and registration begins in November. If you have any items that I’ve missed, please drop me an email via the DJTF Yahoo! Listserv or at regaviationqueen AT yahoo DOT com. Thanks! Back on Aug. 24, I did a post on how the interactive part of South By Southwest (SXSW) has become THE place to come to hear the latest in digital/social/new and multimedia. That post included a plea from organizers to have more diverse panels. The panel picker was released last month, and I went through all 2,400 submissions to pick out the ones I thought addressed the diversity issue. Well, leave it to Maurice Cherry, owner of 3eighteen Media and founder of the Black Weblog Awards, to find some I missed. Cherry compiled the “Tentative List of SXSW Panels by Black People in Technology.” I urge you to look at this list and my list ASAP and make your picks. And please include comments — the organizing committee takes those into account. And also, do it quick, since voting ends today at 11:59 CDT. And speaking of voting, please also support Cherry’s Black Weblog Awards, which recognizes the best in African-American blog writing. Voting ends on Aug. 31, with winners announced Sept. 1. Thanks!! As I was preparing for my journalism branding panel at last month’s National Association of Black Journalists’ annual convention in San Diego, I received an email from Elaine Swann via my Google Profile. 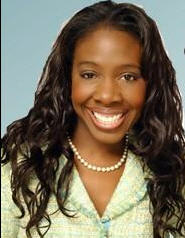 Elaine Swann, aka The Etiquette Lady, just happens to be based in San Diego and was making a pitch to be on my panel. Elaine spreads her brand via appearances as a special correspondent on San Diego’s NBC 7/39 “News in the Morning,” her website, her syndicated column and her line of etiquette-inspired products. In this interview, Swann shares up-to-the minute tools and practical tips from a contemporary perspective, presenting workshops, seminars and one-on-one sessions with private clients. Below NABJDigital speaks to Swann about why you need a brand, how create and maintain the brand and how she did it. NABJDigital: What is your professional background? Elaine Swann: I was a journalist. However, did not take the traditional route of going to school for it. I grew up in California and moved to New York right after high school. I moved there to become a model, but I started hanging around people who were in the entertainment business, so I started a model management company. I met Kate Ferguson, a dear friend who is a journalist. She asked me to start writing for WordUp magazine. I used my English skills to write and learn journalism in the school of hard knocks. I then moved to Today’s Black Woman and became its art director. My career is not traditional, and I don’t recommend it for young people. It’s important for them to go to school. I moved back to California and got my associate’s degree, and continued to write, based on contacts I made. Had I not established a decent relationship with Kate, it would have maybe taken longer to get the skills I needed or I maybe would have gone in a completely different direction. ND: How did you become the Etiquette Lady? ES: I’ve always been a student of etiquette. I did charm school growing up. I also did beauty pageants, where there was always an etiquette portion. In the small military town where I grew up, sorority women knew about my interest in etiquette and asked me to teach it to local debutants back in 1997. I did it for five years. After that, I created a program and a school asked me to do it for students, and wanted to pay me for it. I did after-school programs and realized it was a business. So I created a business plan and model for the business. I auditioned for the reality show “Martha Stewart: Apprentice,” and a reporter pulled me aside and asked what I did. I told her I was The Etiquette Lady. I was then introduced to a television producer who wanted me to do a segment on etiquette. I made it down to the final 25 people for the Apprentice, but I didn’t get picked for the final 16. I went back to NBC in San Diego and from 2005 and 2009 I was a regular. I was also approached by San Diego Union-Tribune to do an advice column, so I did my “Ask The Etiquette Lady” on television and the website, which lit my journalism fire again. ND: What did you do to create your brand as the Etiquette Lady? ES: I literally created my brand during the time of “Martha Stewart: Apprentice.” I researched Martha Stewart and her company, I bought and read books, took notes and did everything I could to understand the company. I was already working on my etiquette book and teaching seminars. I knew I wanted to own etiquette products like thank-you cards. ND: Why do you think journalists need to brand themselves? ES: I believe journalists need to brand themselves because in today society, we want to go to the expert. The powers-that-be always want expert opinions. ES: I say its baloney and that they’re making up excuses. You can brand yourself for free. Social media has leveled the playing field to brand and promote yourself for free. If you can’t get a website, get a blog for free. Pitch yourself to get your placement on the Internet. You can do this for free – you just need to plan. Use your journalistic skills to research where you should set up shop. Have real estate on the Internet in places that are relevant for your field. That’s why I write blogs for Essence and Exquisite Weddings. Last night, we had a spirited discussion during our BlogTalkRadio show Internet Etiquette: Being “Socially” Responsible. Our speakers were Lifestyle & Etiquette Expert Elaine Swann, Howard University graduate student and Google Fellow Kiara Pesante and National Association of Black Journalists student board representative Georgia Dawkins. They were kind enough to re-create their very popular panel at last month’s NABJ annual conference. If you didn’t get the chance to join us, please click on the link above to hear the hour-long show. And if you have any ideas for future topics, please feel free to drop me a line at regaviationqueen AT Yahoo DOT com or on Twitter at @NABJDigital. Please allow me to make a plug for you join DJTF and the NABJ Media Institute later today for a free BlogTalkRadio show: “Internet Etiquette: Being `Socially’ Responsible.” Lifestyle & Etiquette Expert Elaine Swann and Howard University graduate student and Google Fellow Kiara Pesante will give you the do’s and don’t’s on navigating proper Internet etiquette, and we’ll leave plenty of time for your questions. The show is from 7:00 p.m.-8:00 p.m. Eastern time. I hope you can join us! Austin, Texas-based South by Southwest was originally created as a way for the city to celebrate and showcase musical talent. The festival expanded to include films and later, interactive. The interactive part of SXSW has quickly become THE place to come to hear the latest in digital/social/new and multimedia. A virtual who’s who from influential companies and media organizations are at SXSW, participating on panels, offering exhibits and hosting evening functions. But one glaring thing has been a distinct lack of diversity at SXSW. To their credit, the organizers reached out to communities of color, encouraging panel submissions for the 2011 event. The decision on what panels will be featured is divided three ways: 30% staff, 30% open voting and 40% advisory committee. So even if a panel is not picked during open voting, there’s still a chance it will be included. I recently had a few hours to kill on a train ride up to New York City, so I looked at all 2400 panels that are up for voting. Yes, I did it so you wouldn’t have to. Below is my unofficial list of panels that appear to cover people of color. I may have missed some, and if I have, please let me know. It’s been interesting to see all the Tweets from people pushing their panels, and I hope that we can all work together to get some of our panels in the mix at next year’s show. Voting ends at 11:59 CDT on Friday, August 27, so please – help make SXSW 2011 a more diverse affair. Whiteness on the Web: Racism or Culture? 500,000 New Mobile Users Daily? Welcome to India! Where Are The Black Men Techs? Thembisa Mshaka, SEEIT Live, Inc.
Shonika Proctor, Group Interactive, Inc.
Glass Ceiling for Women in Tech Startups- Real? Latin America Travel 2.0: Can Social Commerce Succeed? Are You Ready for the Latin American Market? Can Africa Develop Faster Using Facebook?